FREE KINDLE EBOOK DOWNLOAD APRIL 20-24, 2018! 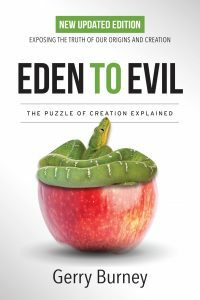 In Eden to Evil, Gerry Burney explains the difference between the two biblical creation accounts, “Eden” creation and the “7-day” creation. They diverge in so many ways that many believe both cannot be true. Did God make a mistake-and how do we fit into the two accounts? But if the two accounts were not a mistake, then God must have given us a riddle that only those who search for truth will uncover. Burney deciphers the riddle to show how the answer helps us understand the Bible and how we view ourselves. Are we sinner or saints? In his new updated edition, Burney builds on the original, clarifying why a third of the angels rejected God’s authority, thus exposing how early civilizations so easily accepted Satan the serpent. Now we can finally understand why we experience suffering and tragedy in God’s “very good” creation and why we need a Savior.